View our online exhibition of objects relating to Coram's 275 years of creating better chances for some of the UK's most vulnerable children and young people. The prayer book of Thomas Coram, Coram's founder, is the first exhibit in a new series, 'Just One Thing...' in which a key figure from the charity selects an item from our archives which is of particular significance for them and an inspiration for their work to continue helping children today, 275 years after the charity was established. Thomas Coram, the words in this book were the script for his life. Religion was important to him and so too was the idea that you practised those beliefs through good deeds in daily life. The words in this book inspired him to establish a totally new kind of charity, the first one in the UK dedicated to the care of children. 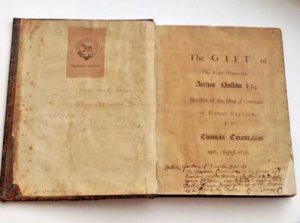 The book was given to Thomas Coram in 1736 by Arthur Onslow, a founding governor of the Foundling Hospital and Speaker of the House of Commons. Thomas Coram presented it to the Foundling Hospital in 1741. Staff and visitors to Coram at Brunswick Square can see the book, was on display until the end of April 2017 in the Weston Gallery.